Becky Hammom is a retired basketball player, and is currently serving as assistant coach for San Antonio Spurs of NBA. Her career is one to be proud of; she played for a number of teams, including San Antonio Stars, New York Liberty and Rivas Ecópolis, as well as multiple international basketball teams. After becoming a Russian citizen in 2008, she also represented the Russian National Team and Olympics. Under her headship, Spurs earned the Las Vegas League title in 2015. Born in 1977, to Martin and Bev Hammom , Becky's inspiration was her brother and father. They not only helped her realise her dream, but were also instrumental is her achieving her goals. They were her pillar of strength and supported her in every way possible. Becky has two siblings, Gina and Matt Hammom. Hammom's first stint with Basketball was while studying at the Stevens High School, Rapid City, Dakota. She made her first mark on the field, when she earned the title of South Dakota Miss Basketball. Her long and fruitful career had just about begun. Hammom went on to move from pinnacle to pinnacle, as during her high school days, she averaged 26 points, 5 steals and 4 rebounds per game, and was elected as the South Dakota Player of the year. In her graduation, she was voted the female class athlete. Tracing Becky's career graph, her dedication and perseverance is apparent. 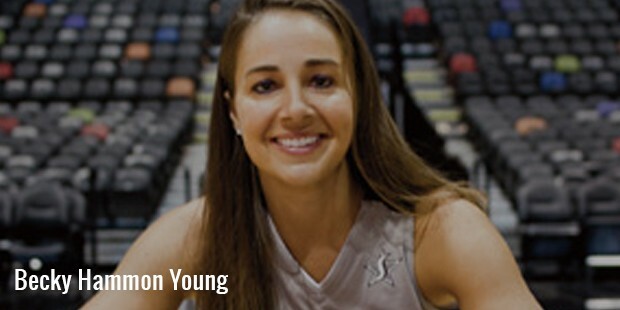 She signed for the WNBA in 1999, joined New York Liberty, and became the team’s co-captain in 2004. Following which, she joined the Colorado Chill team of NWBL, for which she played only two games. In 2007, she played the off-season WNBA with Rivas Futura of the Spanish League. 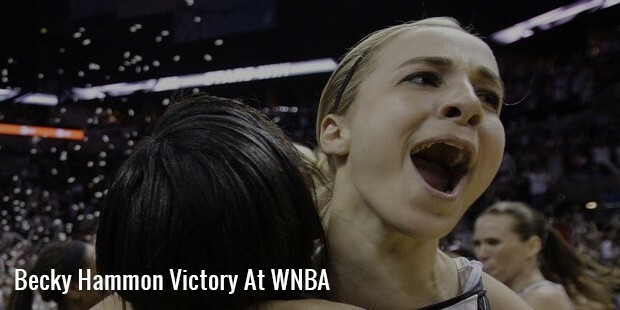 In the same year, she was traded to Silver Stars, which she led to an astounding victory, with the best record of 24-10. 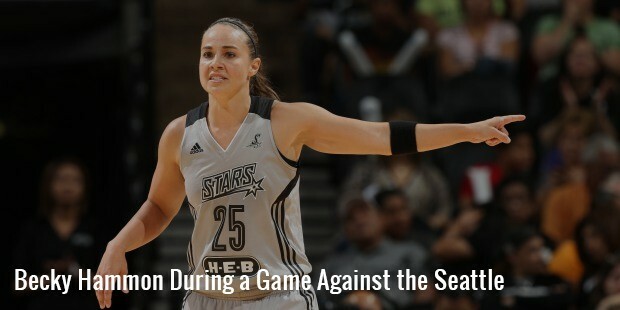 In 2011, she became the 7th player in the history of WNBA to score 5000 points. In 2015, she was introduced to the Ring of Honor, which recognizes players who make significant contributions to Liberty.Her meritorious career took a back-seat, when she suffered a knee injury in 2013. This, of course, could not keep her from her passion; Basketball; and, Hammom continued attending coaches’ meetings, practices and games, and contributing to the game by way of her invaluable suggestions. In 2014, she became the first, full-time, salaried assistant female coach for Spurs in the history of NBA.Becky Hammom was one of the fittest and smartest female basketball players in NBA. She has also proved to be an asset as a coach, displaying high IQ, unmatched inter-personal skills and extraordinary work ethics. She has been an unmatchable asset to game. Becky is very cautious about her personal life, and there is no evidence about her marital status or any affair. 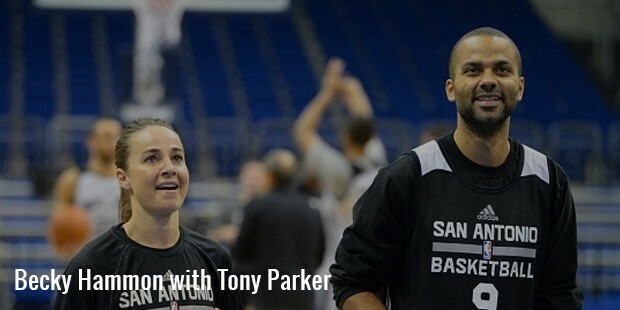 But, there were rumours about Tony Parker being her boyfriend, as he had hired her as a coach. As she is still single, there is speculation about her being a lesbian.